A hyperlocal news site is set to relaunch its printed newspaper after a nine-month break. The Port Talbot Magnet will publish its sixth printed edition later this month, after a break while director and editor Rachel Howells completed a PhD. 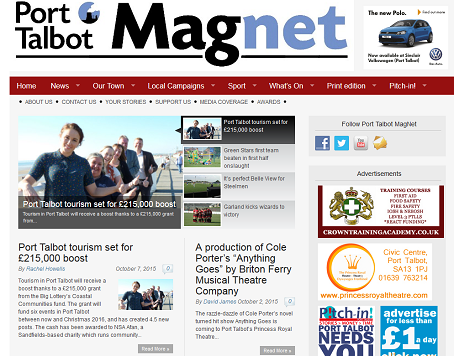 The Magnet started life as a hyperlocal news site in 2010 after the town’s local newspaper, the Port Talbot Guardian, closed down the previous year. It published its first pilot printed edition in April 2013 and four further editions have since been published. It was previously a quarterly publication but Rachel is aiming for it now to become a monthly newspaper. The new 16-page edition will have a print run of 20,000 and is due to hit the streets in late October. Said Rachel: “We’re relaunching it because it’s exciting news and we want people to get excited about it again. For her PhD at Cardiff University’s School of Journalism, she looked into developing a new business model for local news provision. The Magnet is run as a not-for-profit community co-operative, which has a board of eight professional journalists.